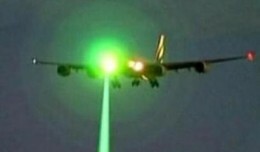 Six months after shining a laser at a plane and a police helicopter, a Long Island man has confessed—and now faces 5 years in prison. Video of a July 6th incident in which an allegedly incoherent woman was forcibly removed from a Spirit Airlines flight after refusing to deplane herself. The University of New Mexico football player who was arrested at San Francisco International Airport for wearing saggy pants has been released on bail. Mexican authorities on Thursday announced that a Bolivian pastor was sentenced to over seven years in prison for the hijacking of Aeromexico Flight 576 in 2009. A Southern California man on Monday was sentenced to 25 years in prison for smuggling many items including surface-to-air missiles into the U.S., prosecutors said.